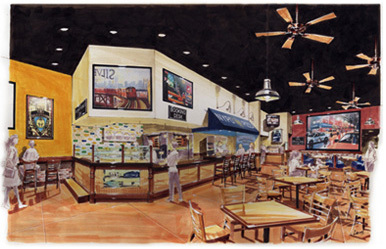 NYPD Pizza has been developing the art of the pizza business since 1996. Our love for pizza started back in New York City in the 1970’s, where founder and CEO of NYPD Pizza, Paul Russo grew up in a prideful Italian neighborhood. He was always surrounded by people who appreciated the experience and flavorful taste of an authentic New York slice. Call it pride, but we wouldn’t serve it any other way. Since we started franchising, we have developed a straightforward system which allows our franchisees to go through training and utilize the elements we created to operate their own business. Our commitment and focus has always been to develop our stores to be a turn-key operation for our franchisees and that is exactly what we have created. From our brand strategy manuals, to our POS software system and restaurant policies; all were designed so that the franchisee would never have to reinvent the wheel. Support, training, national distribution alliances, marketing strategies, and guiding principles are all part of the NYPD Pizza franchise package. There have been modifications to menu items along the way as we grow and thrive, we here at NYPD Pizza constantly develop and research what is best for the franchise system as a whole without compromising our core quality product. 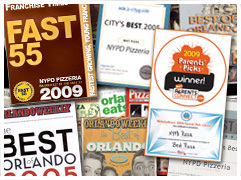 From the first year of stepping onto the pizzeria scene in 1996, we have been awarded scores of awards including Best Pizza in Orlando as well as other cities around the United States more than 30 times. NYPD Pizza has been ranked one of the Top 55 fastest growing franchises in Franchise Times Magazine and listed as a Top 200 Pizzeria in PMQ Magazine. With our many years of experience and dedication, we have looking to expanded the NYPD Pizza Team and brand in select regions of the United States. NYPD Pizza is in the pizza business to give the people what they want, and that’s a Authentic New York slice of pizza! We are devoted to superior customer service and will only use the highest quality ingredients available to produce our menu items. Our business model will continue to expand and prosper with enthusiastic partners we call franchises and our relationships will always be based on personal practice. You are never referred to as just a number within the NYPD Pizza franchise system.